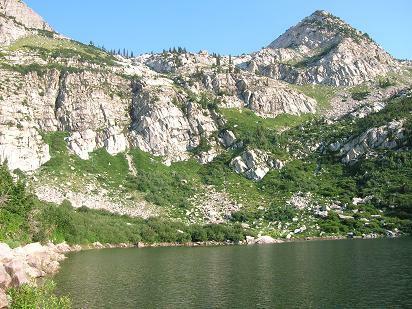 Silver Lake is a small, high-elevation lake in Utah County, located above Silver Lake Flat Reservoir in American Fork	Canyon. The hike is about 2.2 miles each way, through a fairly treeless area in some parts, with little shade, so bring plenty of water and try not to hike in the middle of the day during the hot summer months. There are a couple of streams where you can filter water along the way if needed. Camping area is limited at Silver Lake, however there is space for a few tents around the lake. The ground is very rocky with lots of granite. Wildlife such as moose and beavers frequent the area, and the view is spectacular! Silver Lake is periodically stocked with Rainbow and Brook Trout, as well as Arctic Grayling by the DWR. The most recent stocking as of this writing were in 2017, where both Brook Trout and Arctic Grayling fry were stocked into Silver Lake by plane. Many of these fish should be small, but still catchable size by now! Make sure to make a note in your calendar to fish hike to this beautiful lake soon and do some mountain fishing. Silver Lake is certainly worth the relatively short hike, even if it does steadily gain elevation nearly the entire trail. It provides beautiful high mountain scenery, cooler temperatures, and good fishing that is close to home. Check our latest fish stocking reports for updates on the most recent stockings done by the Utah DWR. Fishing at Silver Lake is generally very good for small, wild brook trout using a variety of small spinners or dry flies. Using the 'fly and bubble' combination with a spinning rod is a good way to flyfish, since there is little room for backcasting around the lake from shore. This is a great lake to pack up a lightweight float tube and flyfish from the tube.